Charles Ian Finch-Knightley, 11th Earl of Aylesford DL, JP (2 November 1918 19 February 2008), styled Lord Guernsey between 1940 and 1958, was a British peer. He was educated at Oundle School. He served in the Second World War where he was wounded. 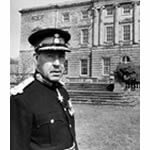 After the war he was appointed a Justice of the Peace for Warwickshire in 1948 and a Deputy Lieutenant of the county in 1954. He succeeded his father in the earldom in 1958. In 1974 he was appointed to the new post of Lord-Lieutenant of the West Midlands, a position he held until 1993.